Myeloid cells belong to the innate part of the immune system generated in the bone marrow from common myeloid progenitors. From the bone marrow they migrate into the blood and lymphatic system where they are the first line of defence against infections. However, unlike lymphoid cells such as B and T cells, the myeloid compartment of the immune system does not adapt to a previous infection or vaccination. Common cells of the myeloid compartment include monocytes, macrophages, dendritic cells, granulocytes and mast cells. Each cell type has a specific function in the generation and resolution of an immune response. Myeloid cell subsets can be difficult to identify due to variability and low level expression of markers and the rarity of some populations. This guide to immunophenotyping of human myeloid cells takes you through some of the common markers and gating strategies used to identify myeloid cells by flow cytometry, with examples of data acquired on the ZE5™ Cell Analyzer. After migration from the bone marrow, monocytes circulate until they are stimulated where upon they leave the blood into the surrounding tissues where they can differentiate into macrophages or dendritic cells. The main function of monocytes and macrophages in disease are to phagocytose pathogens and produce pro-inflammatory cytokines, as reviewed in our monocyte mini-review. Macrophages however, can differentiate into specific functional subsets, characterized through specific markers, depending upon the stimuli. This new classification of human and mouse macrophages was first proposed by Mills et al. (2000) after observations of differential macrophage arginine metabolism in mouse strains with Th1 and Th2 backgrounds. This finding led to a consensus that M1 macrophages exhibit inflammatory functions and M2 macrophages were anti-inflammatory. This is now considered oversimplified with many more subsets identified. Dendritic cells (DCs) are a group of developmentally and phenotypically diverse, highly migratory professional antigen presenting cells that play a major role in the stimulation of T cells. They can be derived from either common lymphoid or common myeloid precursors in the bone marrow that develop into mature DCs from blood borne monocytes. Immature DCs capture and process antigen in the periphery whereupon they migrate to lymphoid organs where they present the antigen in the context of MHC-II to lymphocytes. No single marker has been found for DCs therefore many combinations of markers are used to identify the various DC subtypes. The granulocyte population is composed of four subsets: neutrophils, eosinophils, basophils, and mast cells. They are named after their characteristic morphology as they contain large cytoplasmic granules that can be stained by basic dyes. Granulocytes migrate to the site of infection where they release a range of effector molecules including enzymes, histamines and cytokines as well as phagocytosing pathogens and cellular debris. As a result these cells have a significant role in inflammation and allergic responses. Although there are some general markers to detect myeloid cells, for instance CD11b in mice and some specific markers for monocytes, such as CD14 in humans, the exact markers used to identify the different myeloid cells can vary depending on the subsets and external stimuli received. Myeloid cells do often lack lineage markers for other cell types such as B and T cells allowing these to be excluded from your analysis. For more information on all the cells of the innate immune system and the antibodies and reagents that can be used to study them, visit our dedicated innate immunity webpage. Successful flow cytometry panel building relies on careful planning prior to staining. This includes careful sample prep, knowing the biology of your sample, understanding your flow cytometer configuration and performing the right controls. Markers were first identified from the literature which would allow us to label specific cell subsets of human peripheral blood myeloid cells. These include classical and non-classical monocytes, dendritic cells, neutrophils and eosinophils. A list of the antibodies used can be found in Table 1. Marker selection can be challenging especially with myeloid cells where there may be several markers reported in the literature. To help you find the right marker we have developed a new interactive marker selection tool containing all you need to know about immune cells, lineage, marker expression and the marker protein itself. Table 1. Myeloid cell panel. Abbreviations: Axxx, Alexa Fluor; APC, allophycocyanin; FITC, fluorescein isothiocyanate; PB, Pacific Blue; PE, phycoerythrin; Pur., purified. The appropriate controls for this multicolor flow cytometry experiment include an unstained sample to look at autofluorescence, single stained samples to allow a compensation matrix to be generated, isotype controls to check for non-specific background staining, and fluorescence minus one (FMO) controls to account for spreading of the data and allow gate setting. The FMO control for CD16A700 is shown in Figure 1 as an example; however an FMO was performed for all possible combinations. Fig.1. Fluorescence minus one control. A, cells were stained with all antibodies in the panel minus CD16 A700 (MCA2537A700) which was replaced by an isotype control. B, the FMO control allowed us to set a gate to separate neutrophils from eosinophils in the full stain. Myeloid cells have Fc receptors on their surface to help destroy pathogens through antibody mediated phagocytosis or antibody dependent cell mediated cytotoxicity. As this leads to unwanted non-specific binding of antibodies, the Fc receptors found on myeloid cells were blocked using 10% human serum. Some myeloid cells such as granulocytes have a short lifespan and can die if left for long periods of time or through poor sample preparation. Specifically, neutrophils can become activated by centrifugation or vortexing, which then leads to cell death. Therefore a viability dye was included to allow removal of dead cells which can also bind antibodies non-specifically. In Figure 2, freshly harvested blood was compared to four-day-old blood for the presence of granulocyte subsets. As can be seen in the old blood sample, the CD13+CD16- eosinophil population has clearly disappeared. Additionally, care may need to be taken with some tissue samples as mechanical disruption or homogenisation may result in many dead cells and cell clumping. Addition of EDTA and DNAse I to your harvest media and filtration through a 70 mM filter can help prevent clumping and blocking the cytometer. Fig.2. Loss of cell populations with old samples. A, fresh blood was stained for CD13 (MCA1270PE) and CD16 (MCA2537A700) to identify neutrophils and eosinophils. B, CD13+CD16- eosinophils have clearly disappeared in the four-day-old blood sample. 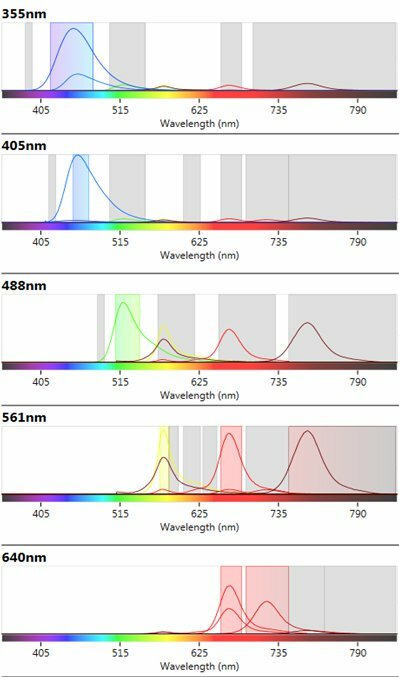 Instrument configuration can affect the availability of fluorophores which can be used in a multicolor panel. The ZE5 Cell Analyzer has five lasers and 27 fluorescent parameters allowing the fluorophores used to spread across the lasers and filters to minimize fluorescence spillover where possible. In addition the spectra viewer included in the software allows users to visualize any potential conflicts between fluorophores (Figure 3). Furthermore abundant markers, such as CD11b and CD16, were placed on relatively dim fluorophores to allow better resolution of less abundant markers with bright fluorophores. Fig 3. ZE5 Cell Analyzer spectra viewer. Emission profiles of fluorophores chosen in the myeloid cell panel to show fluorophore spillover and cross-laser excitation and emission. Although we have not included it on this panel, often a dump channel is useful to allow easy gating out of multiple populations. As myeloid cells do not express certain T, B and NK markers, such as CD3, CD19, and CD161, these can be easily included in a dump channel to avoid contamination of your results with these cells. Be careful however as monocytes do express T cell markers such as CD4. The cells to be stained were as fresh as possible and kept under conditions likely to maintain cell health. The staining protocol was optimized by titrating all the antibodies to the point where they gave the optimal stain index, which is the difference between the positive and negative population mean fluorescence intensity. This information is also included in Table 1. The frequency of myeloid cells in human peripheral blood is highly variable with some subsets, such as eosinophils and dendritic cells, representing only a small fraction of this population. Therefore we acquired 6 x 105 cells to ensure we could visualize and accurately gate all the relevant populations. We have comprehensive resources on multicolor panel building and flow cytometry. Click on the links below for more in-depth information on multicolor panel building and view our popular flow cytometry basics guide. An initial gating strategy was used to firstly identify myeloid cells and to exclude lymphoid, dead cells and doublets. This initial gating strategy is shown below in panels A, B and C (Figure 4). To identify specific myeloid populations CD15 was plotted against CD4. CD4 has been shown to be a reliable lineage marker for antigen presenting cell populations as well as a marker for T helper cells (Jardine et al. 2013). 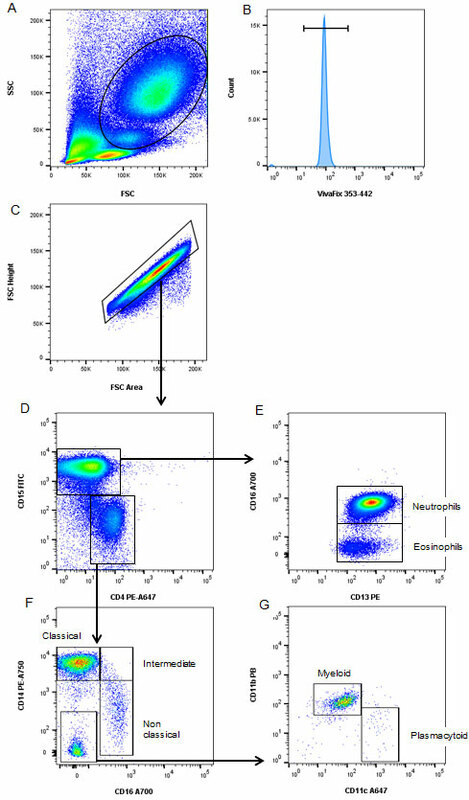 This allowed the granulocyte subsets of neutrophils and eosinophils to be identified based upon CD15, CD16 and CD13 expression (panel D and E). The CD4 positive cells were gated further to identify monocyte and dendritic cell populations. CD14 and CD16 expression allowed identification of classical, intermediate and non-classical monocyte populations (panel F). DC populations that were CD14 and CD16 negative could be further catagorized into myeloid and plasmacytoid DCs based upon CD11c and CD11b expression (panel G). Many more makers can be used to aid in the classification of myeloid subsets. For example, CD141 and CD123 enable the split of DC populations into distinct subsets. The importance of collecting a large number of cells can be seen in panel G when identifying DCs. If you do not collect enough cells you will not be able to accurately identify these smaller populations. Fig. 4. Characterization of human myeloid cells using as 8-color panel. Human peripheral blood was stained with CD15 FITC, CD4 PE-A647, CD16 A700, CD13 PE, CD14 PE-A750, CD11b PB, CD11c A647 and VivaFix 353/442 Viability Dye used to identify various myeloid cell subsets. A, forward and side scatter was used to exclude lymphoid cells. B, dead cells were excluded. C, doublets were excluded. D, CD15 and CD4 were used to separate granulocytes from monocytes and DCs. E, CD16 and CD13 allowed identification of neutrophils and eosinophils in the CD15 positive fraction. F, classical, intermediate and non-classical monocytes were identified using CD14 and CD16 expression in the CD4 positive fraction. G, DC subsets were identified from the CD14/CD16 negative cells using CD11b and CD11c. Using an eight color panel we have successfully managed to identify up to seven distinct myeloid cell subsets in human peripheral blood. For more information on lineage and maturation markers for human and mouse myeloid cells and access our range of immunology antibodies, reviews, posters and selection marker tools, visit our dedicated innate immunity page. In addition to antibodies to detect myeloid cells, we have over 4,000 antibodies validated for flow cytometry as well as helpful resources to help you build multicolor panels. These as well as listings of antibodies, kits and controls can be accessed from our dedicated flow cytometry page. Mills CD et al. (2000). M-1/M-2 macrophages and the Th1/Th2 paradigm. J Immunol 164, 6166-6173. Jardine L et al. (2013). Rapid detection of dendritic cell and monocyte disorders using CD4 as a lineage marker of the human peripheral blood antigen-presenting cell compartment. Front Immunol, 4, 495.